Music is the star of the annual Coachella festival, which kicked off April 15 for the weekend and resumes April 22, but virtual reality is starting to grab its own headlines. Coachella and Vantaget.tv recently announced the launch of its own virtual reality app, which allows owners of VR headsets (either the fancy kind or the cardboard variety) to get limited VR content such as enhanced performances and virtual tours of the grounds. VR start-up Livit has already developed a way to live stream event content as a VR experience to mobile users. The Livit app, connected wirelessly to a 360fy panoramic video camera, delivers VR content to users who have downloaded the Livit app on Android and iOS devices (with no headset required). And Livit has done so already at the Ultra Music Festival. 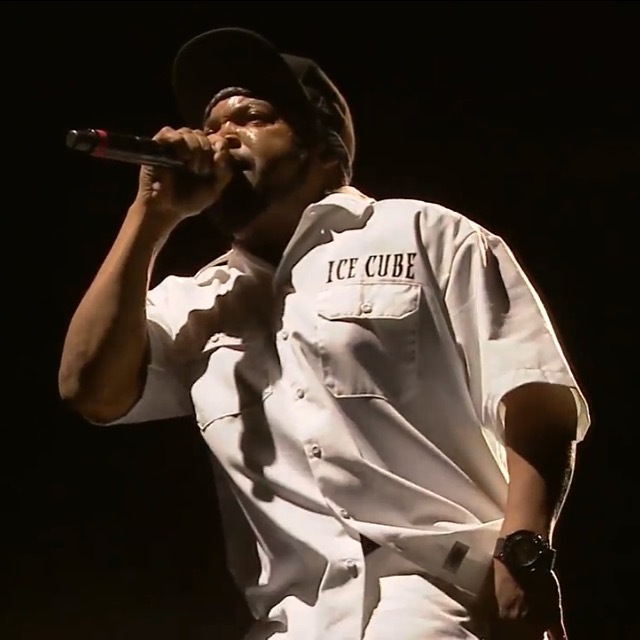 Author screen shot of Ice Cube via 2016 Coachella live stream. Livit also makes it possible for people to communicate with each other through comments posted on the live stream — a form of social VR, which got a big boost recently when Facebook demoed social VR experiences at its annual F8 Developers Conference. Experiencing events is inherently a social experience. Usually watching an event socially from the comfort of your living room means tweeting or Facebooking as we watch events such as the Academy Awards, Coachella, and the Super Bowl together. Virtual reality, coupled with social sharing, could reinvent the entire concept. Imagine a Coachella concert goer in Chicago entering a Coachella virtual reality room to watch the Cvrches with other huge Cvrches fans, a scenario that is very plausible thanks to AltspaceVR. This company has created software that allows users with the appropriate VR headsets to communicate with each other in VR settings (think of Skype or Google Hangouts taken several steps further) while they either meet or enjoy an experience such as watching House of Cards together on Netflix in a VR room. Author screen shot of Grimes via 2016 Coachella live stream. And events could monetize these experiences by cozying up to advertisers with many kinds of branding opportunities, such from title sponsorships and having branded elements in VR rooms. Coachella is the perfect venue for the converging worlds of social virtual reality and live streaming. Coachella already does an excellent job streaming concerts to people (like me) who cannot be there in person, and Coachella hosts a chat room for live streamers (and while chat rooms are hardly state-of-the art, the fact that Coachella hosts one demonstrates that the event organizers are moving in the direction of curating live social experience beyond the usual social media platforms). Clearly, Coachella digs VR. Soon, the concept of streaming Coachella may seem quaint as we hop into listening rooms, pump our arms in the air, and swoon over new music from Grimes or the 1975, right in the room with us. This entry was posted in Music and tagged AltspaceVR, Coachella, David Deal, Facebook, GoPro, Livit, social virtual reality, Stereostitch, Superhype, virtual reality, VR. Bookmark the permalink. Pingback: Live Streaming Media in VR/AR. – Virtual Reality/Augmented Reality and Social Media in 2030.